Hi, I’m Cat from @tincatsew on Instagram. 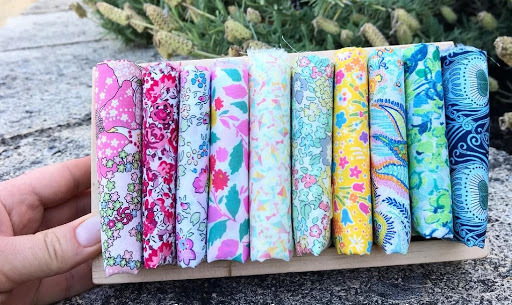 I am very excited to announce the start of the Liberty Society Kantha Stitchalong for 2019. At the beginning of last year I was inspired to try Kantha stitching after seeing a cushion on Instagram made by Heidi from @bessaboostudio. Everything about it sang texture and comfort. 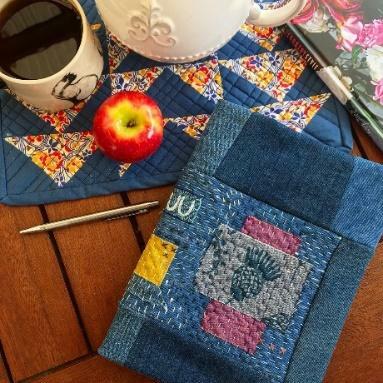 Kantha stitching was new to me so I thought it would be fun to learn with friends and that is how the original stitchalong was born. We had a lot of fun stitching together. Here is the cushion I made last year. So, what you’ve all been waiting for … the details for this year’s stitchalong. First of all the hashtag is #libertysocietykanthastitchalong. A mouthful, I know, but informative! Go ahead and follow the hashtag now so you don’t miss a thing. Use the hashtag for all your posts so everyone can see your progress. 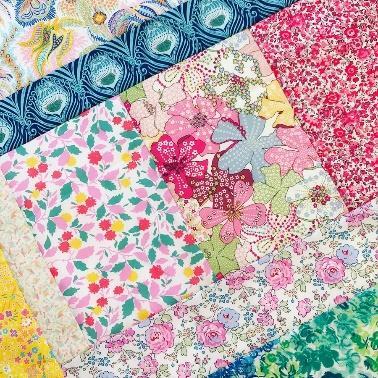 The inspiration for everyone participating is simple patchwork, Liberty Society and Kantha. Be inspired and let your imagination run wild. What is Liberty Society you may ask? It is a bundle of the month subscription from Ava & Neve. They select 10 fabrics each month and post them to you. I receive the bundle each month and it is always a wonderful source of inspiration to me. I think it is because I haven’t chosen the fabrics myself that they speak to me in unexpected ways. The December 2017 bundle was the fabric bundle that inspired the original stitch along. I made my cushion from last year just from this bundle. You can find out more over at the Liberty Society tab on Ava & Neve’s website. However, you are welcome to use whatever fabric you like. I enjoyed using Liberty last year. The fabric is so soft and silky so the texture was amazing. 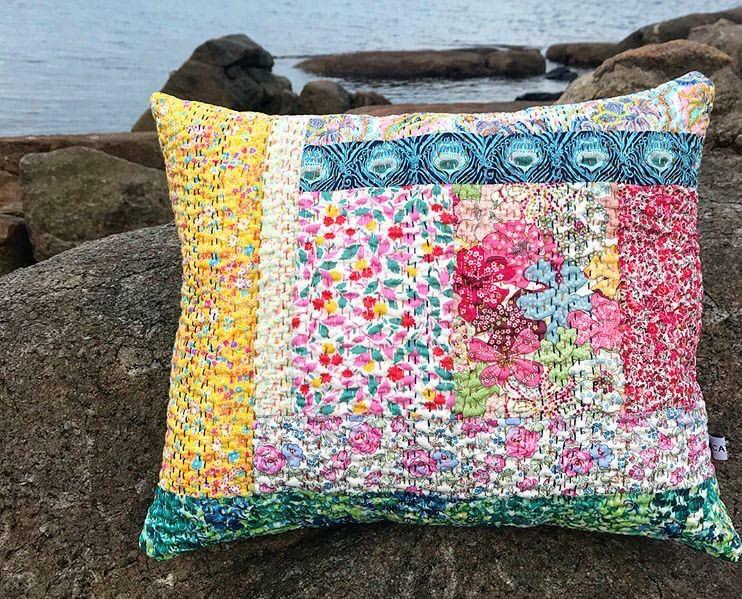 The traditional art of Kantha stitching extends far beyond my capabilities but it was the inspiration for the cushion I made last year. You will find below some information about how I made the hand stitched panel for my cushion. I hope it gives you some useful information to develop your own project but please be aware that I am not an expert. The idea of the stitch along is to share our ideas and help each other. If you think you have a better way, please tell me! Post it on the hashtag and tell us all. My friend Heidi from @bessaboostudio posted some great tutorials and tips last year. You can find these for the duration of the stitch along in her highlights on her Instagram profile. They are definitely worth checking out! Please also note that I do not use a traditional Kantha method. 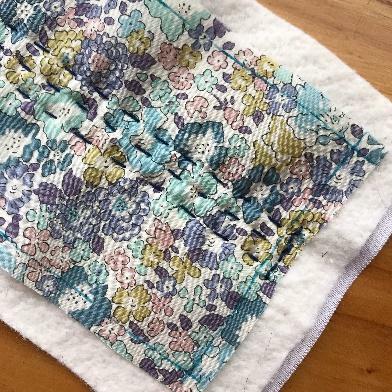 The method below is inspired by Kantha and an adoption of the style of stitching for a quilting purpose by the addition of cotton wadding. You are welcome to choose whatever project you like. Last year most of us made cushions but the possibilities are endless for example: quilts, bags, wall-hangings and scarves. There are some fabulous creations on the hashtag from last year that I know will inspire you. Here are some Kantha inspired projects I made last year. Reverse applique wall hanging. 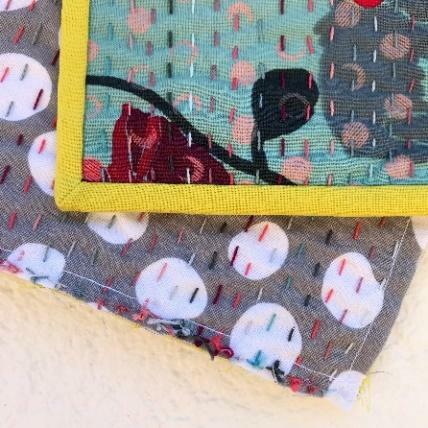 Pattern for the reverse applique rose in Sedef Imer’s book Quilt Petite. Kantha table runner in the background. I intended it to be used as a scarf but the cotton quilting fabric was thick and the binding gave it too much structure so I am enjoying it as a table runner. The stitchalong will officially commence on 22 March. We will be sewing until the end of April. I have arranged a Maker’s Showcase for 23 March to 31 March. A group of inspirational ladies (mainly those who participated last year) are going to post photos of their creations and tell you a little bit about their process as well as share some tips. I know you will be inspired by their creations and pick up some handy hints. The schedule for the Maker’s Showcase follows. Head over and follow these lovely ladies so you don’t miss a thing. During the showcase you might wish to post an inspiration mosaic for your own project, share some Kantha you have stitched previously, gather your materials and prepare the simple patchwork base for your project. Once April starts it is time to start stitching and we will be stitching for the month. Those of you who have sewed along with me before will know that my sewalongs are very relaxed with few rules. You do not have to adhere to this schedule. You can start stitching whenever you are ready and join in late too. I expect many of us will be stitching after April ends. Feel free to continue using the hashtag after the official end of the stitchalong. Ok, now for the exciting bit. Ava and Neve are giving away prizes again this year. They have three surprise fabric bundles up for grabs. The winners will be drawn randomly. You will need to follow @avaandneve and @tincatsew to be eligible. You will automatically be entered into the draw each time you post during the stitchalong using the hashtag #libertysocietykanthastitchalong and tag both @avaandneve and @tincatsew. The prizes will be drawn on 10, 17 and 24 April and the winners will be announced on my Instagram page. Next is some information about how I made the hand stitched panel I used to make a cushion last year. A thimble is a must! Piece a fabric panel from your Liberty measuring 16 by 19 inches. Cut rectangles from your cotton batting and plain neutral fabric measuring 18 by 21 inches. Make a quilt sandwich from your Liberty, wadding and neutral fabric. Thread baste. Imagine (or draw with a disappearing fabric marker) a seam allowance of ¼ of an inch within your pieced panel. This is where you should commence and end each line of stitching. Commence your first line of stitches in the centre of your panel with a vertical row of stitches. Sew a locking stitch to secure the start of your stitching. This was something I learnt from @stitchingbliss during last year’s stitchalong and it is a great way to keep your stitches secure and neat. Sew a running stitch the entire length of the panel. Gently pull the line of stitching from both ends to prevent bunching. Complete your row of stitches with another locking stitch within the seam allowance. Repeat with lines of stitching ¼ of an inch apart. Alternate the start of your stitch lines from one side of the panel to the other to guard against skewing of the stitched panel. Balance the colours of your threads however you wish. This is part of the fun! Once you have hand stitched your panel it is important to secure your threads. 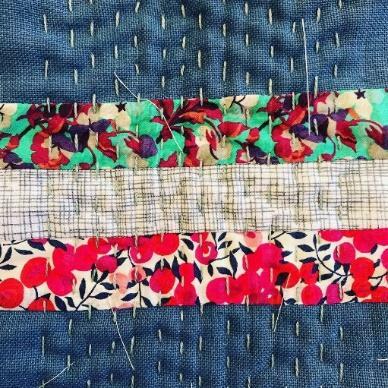 Stitch around the panel on your ¼ inch seam line twice using your sewing machine encapsulating all locking stitches within the seam allowance. Increase your seam allowance so that all locking stitches are encapsulated if you need to. 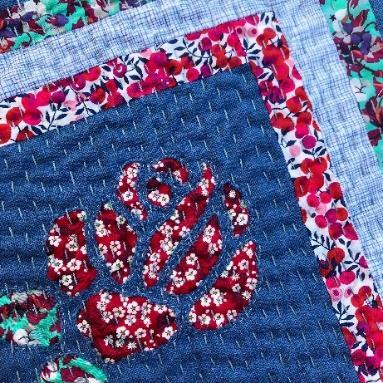 You now have a Kantha inspired hand quilted panel you can convert into any project you like! There is no need to stress about whether your stitches are perfect. 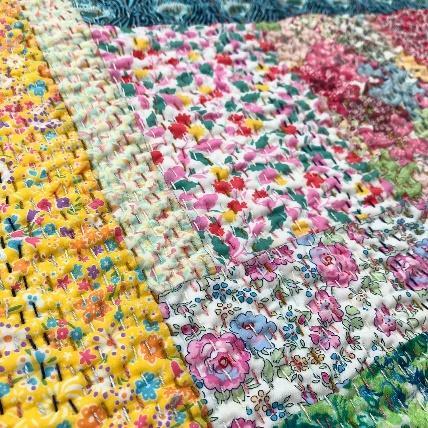 The project is so densely quilted that any inconsistent stitches will not be noticeable by the end of your project. 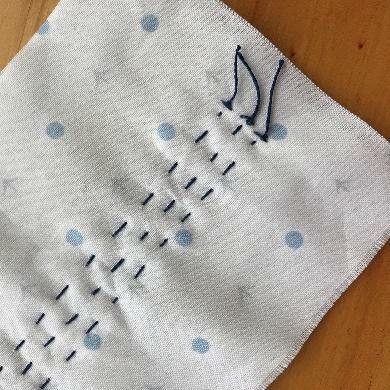 There are a number of different ways to sew the stitches. You can bring the needle all the way up through the layers and out through the top completely before starting your next stitch. I find it easier to sew neat consistent stitches using this method. However, you do not need perfect stitches for this project. The way I prefer is to rock my needle through all the layers picking up about 3 stitches on the needle before pulling it through. I use both hands to achieve the rocking of the needle through the fabric. Play around with different methods until you find your favourite. Some people prefer a thimble on each hand to help with the process. 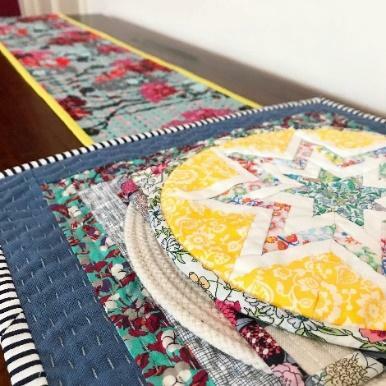 If you are new to hand quilting it will likely take some practise to achieve consistent neat stitches on the front and back of the stitched panel. That is the ultimate goal but by no means a barrier to a beautiful project. Keep practising! It will improve over time and if you are not happy with the back of the panel you can always choose a project, like a cushion, where it will not be visible. I love the cushion I made last year but I felt that the texture on the back of the cushion top was lost inside the cushion. That is why this year my project is going to be a quilt! All the details of my quilt will be released on my Instagram page during the stitchalong so stay tuned.